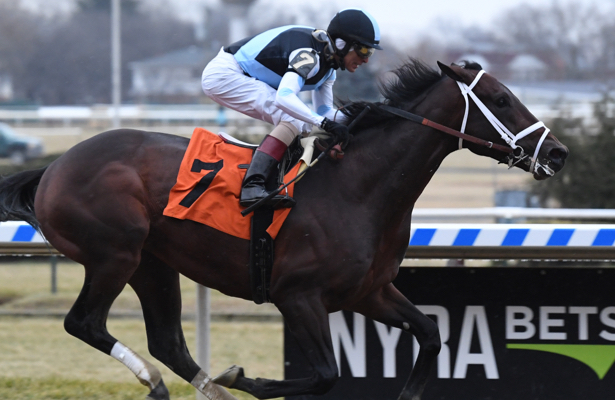 Aqueduct’s Grade 3 Withers Stakes marks the second stop on New York’s road to the 2019 Kentucky Derby, with Saturday’s race carrying a $250,000 purse and Derby qualifying points to the Top 4 finishers on a 10-4-2-1 scale. The mile and an eighth distance represents a challenge for most 3-year-olds at this point in their careers, but the deep racing surface at Aqueduct makes it an even tougher task. This stretch out from any one-turn distance to this two-turn feature will quickly make it clear if a horse can handle the Triple Crown distances. The Withers, which attracted seven runners, is carded as Race 9 out of 10 with post time scheduled for 4:30 pm E.T. Here is a look at the field with the morning line by Horse Racing Nation. Tax [ML 4-1 – Arch – D. Gargan/J. Alvarado – 3: 1-1-1 – $48,800] Trainer Danny Gargan claimed Tax out of his maiden victory at Keeneland from Claiborne Farm. Gargan brought him back to run third in the Remsen (G3) behind two well-regarded 3-year-olds. Since then, R.A. Hill Stable and Reeves Thoroughbred Racing bought a share in the horse. He is one of two in the race that has Derby qualifying points already. Tax stayed in New York and has been training at Belmont Park. Gargan prefers to be aggressive with his horses as we saw in the Remsen, but he’ll find plenty of company contending the pace in here. Use underneath. Sir Winston [ML 6-1 – Awesome Again – M. Casse/D. Davis – 5: 2-0-1 – $74,050] We have already seen Mark Casse make a successful surface switch with a horse on the Derby trail this year. That is not to say that this son of Awesome Again will have the same result as Lecomte winner War of Will. Casse is always willing to take a shot with his runners, and this one shows three nice starts on the synthetic at Woodbine. For what it’s worth, his first two races on the dirt and then the turf were poor; however, Casse feels, “He’s a horse that has gotten better as he’s gotten older.” Use underneath. Moretti [ML 9-5 – Medaglia d’Oro – T. Pletcher/M. Franco – 2: 1-1-0 – $51,400] This son of Medaglia d’Oro sold to the partnership of Repole Stables and Eclipse Thoroughbreds for $900,000 as a Saratoga yearling. He was bet down to be an odds-on favorite in his second start and was an impressive winner going the mile and an eighth distance. He raced a bit greenly down the stretch that day once feeling the stick a couple of times. He stayed in Todd Pletcher’s Belmont Park barn since that win in December to target this race. The top pick. Admire [ML 8-1 – Cairo Prince – D. Romans/R. Albarado – 2: 1-0-0 – $48,060] The Albaugh Family Stable bought this son of Cairo Prince as a yearling for $380,000. He broke his maiden in a race that was meant for the turf at Churchill Downs going a mile and an eighth in November. Since then, trainer Dale Romans sent him to train at his Gulfstream Park winter base. Romans has had luck in the past on the New York trail to the Kentucky Derby. Live longshot. Our Braintrust [ML 5-2 – Freud – M. Casse/J. Lezcano – 4: 2-2-0 – $166,640] One of two Mark Casse runners in the field, he was the second-place finisher in the Jerome just a length behind Mind Control and four lengths in front of the rest of the field. Owner Gary Barber purchased the son of Freud after the Jerome and sent him to Casse. The Maryland-bred has a New York stakes win to his credit in the Tremont at Belmont Park in June. He is one of only two horses in the field with any Derby qualifying points. Win contender. Not That Brady [ML 15-1 – Big Brown – R. Rodriguez/R. Gutierrez – 5: 2-1-0 – $103,400] This New York-bred broke his maiden by more than 11 lengths and then won a stakes race by three. Both of those victories were in state-bred races, and were won on the front end in one-turn miles at Aqueduct. At the very least he will help ensure a quick early pace. Toss. Summary: The Withers looks like a race that has plenty of horses that prefer to run on or near the early lead. Traveling nine-furlongs on the front end at Aqueduct in a competitive field is a daunting task this time of year. Give the off-the-pace runners a serious look with Moretti, Admire, Our Braintrust and Sir Winston all fitting that category.